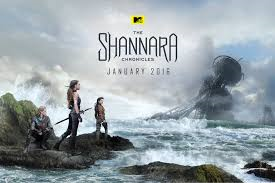 The Shannara Chronicles (MTV) Rated TV-14 | What to Watch. Based on the novels by Terry Brooks. A series chronicling the history of adventure, war, and evil between four lands. Starring Austin Butler, Poppy Drayton, Ivana Baquero, Manu Bennett, Aaron Jakubenko, Emilia Burns, John Rhys-Davies. I was surprised to see that MTV was taking on this series and even more surprised at how well it was done. This show brings Brooks’ epic novels to life on the screen. Given the density of material, they are sure to have to sacrifice some of the content, but so far, they are capturing the story well. Not surprisingly, the beautiful cinematography comes courtesy of New Zealand, home to other epic greats like The Lord of the Rings and The Hobbit. If you are a fan of Brooks’ novels or love fantasy, you will enjoy this series. Be forewarned that MTV does not shy away from the gory aspect of the books. Definitely worth a watch. This entry was posted in 2016, Adventure, fantasy, MTV, Rated TV-14, reviews, Sci-fi, Tv shows and tagged Aaron Jakubenko, adventure, Austin Butler, Based on the novels, books, chronicles, Emilia Burns, epic, evil, fan, fantasy, four, history, Ivana Baquero, john rhys-davies, lands, life, love, Manu Bennett, Mtv, New zealand, on-screen, Poppy Drayton, screen, series, show, Terry Brooks, The hobbit, The Lord of the Rings, The Shannara Chronicles, trailer, trilogies, TV series, Tv shows, war, worth. Bookmark the permalink. Pingback: New This Week on DVD, May 15, 2018 | What to Watch.